I've been trying to write this post for a couple weeks to avoid the last minute rush - but ha ha, time has got away from me. Mainly because I caught some kind of flu bug at the start of December and didn't start feeling better until I went in for antibiotics two weeks later. Blech. And then the rush was on. Am I the only one who feels that being sick is so ineffective? I'm writing this on Dec 23rd so it will be Christmas Eve morning by the time you read this. 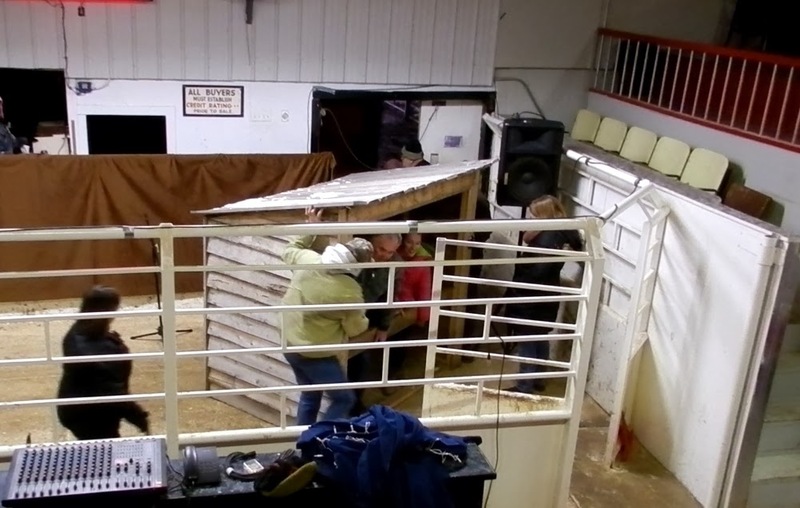 Tonight, our church puts on our 2nd Live Nativity production at the local Candiac Auction Mart and among other things, I've been busy working on the script. 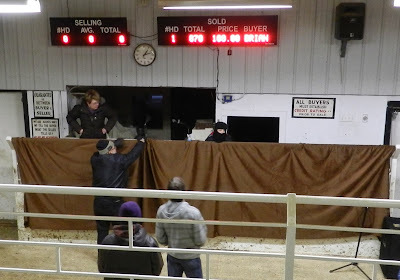 Because the auction barn had a big cattle sale on Friday, yesterday after church was our first chance to get into the auction mart for setting up. As you can see, it takes a lot of teamwork for our little country church to pull off a production of this scale, but with God's blessing, we hope to repeat- and better - last year's performance. Pour saucepan sugar mixture over rolled oat mixture in bowl and mix well. Drop by spoonfuls on waxed paper or parchment lined cookie sheets until they harden, although you must act quickly. *If you use margarine instead of butter, you will have to keep in fridge or they'll be soft and sticky. I'd show you a photo, but my family eat these so fast, by the time I reach for my camera, there are only bits of chocolate and coconut left on the tray. It takes ingenuity and imagination to costume the cast of an amateur Biblical production. 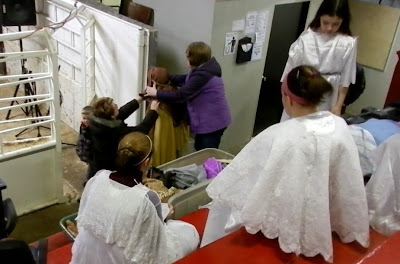 Do you recognize what some of the angels are wearing, or the wiseman that Karen and Dianne are dressing in the Costuming photo? 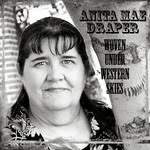 Anita Mae's News! - If you tried to order A Cup of Christmas Cheer and were told they were out of stock, you can try again if you wish because after a second print run, they're back in stock! That sounds like a lot of hard work, Anita. I've never been involved in a Christmas pageant. I would love to see one live. The cookies sound wonderfully yummy. 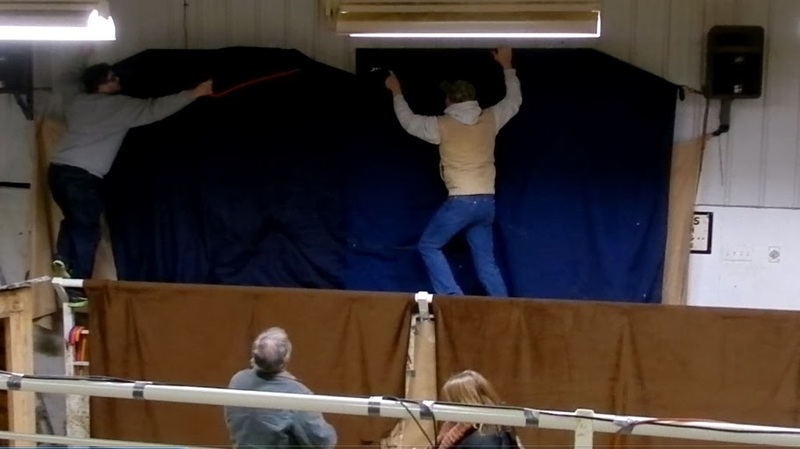 And yes, it is a lot of hard work, but it's one of the main outreaches of our less than 50 member church, and almost everyone pitches in to do their part. A few intensive hours, but well worth our efforts. 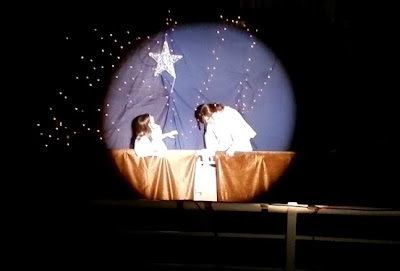 I used to help with youth Christmas plays. What a zoo! But so much fun. 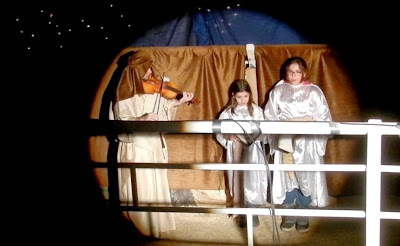 Thanks for posting about the live nativity! Fantastic!! Wish I lived a little closer so I could see it! I haven't made those cookies in years! mmmm!! I didn't know about the difference between butter and margarine in them though! I'll have to remember that! Elaine, I filmed the whole thing and will be working on transferring it to a couple YouTube videos soon. Because of the -24C weather, we had to use a stuffed sheep because real ones would have been too stressed, but this year we had a Roman soldier on a horse who read out a decree. Many people liked that. We have a stove top cookie recipe as well, but I haven't made it in years. I'm so excited that your COCC books are into a new printing. How wonderful! Good for you, Anita, and Merry Christmas and Happy Boxing Day to you and yours. Hope Nick is feeling much better in the morning. yes, PS - Nick dislocated his shoulder so if Anita isn't on here commenting, you all know why! Deb, this year Karen dressed the angels in white wing-like capes which were really tree skirts. I thought they looked great! Re Nick - thanks for filling them in, Deb. Nick felt an oncoming seizure today and dislocated his shoulder in his attempt to make it to the sofa. We're back at home and he has to wear a sling for the next week. He is very disappointed that we missed the Christmas Eve service tonight as he was going to play his ukulele there for the first time, but if he keeps his arm still and allows it to heal over the next few days, he'll be okay to play it when he does Praise and Worship with Nelson on the 29th. Please pray for Nick if you think of it.